Mind you this wasn’t a super motor from the Shelby factory. It was an off the line offering in the era of American muscle. Here are some the details. 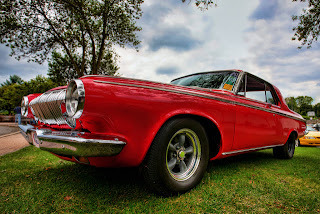 The Max Wedge 426 was a beast of an engine, a MOPAR stud that predated HEMI. It came about because Plymouth wanted to take advantage of NHRA and NASCAR rule changes regarding maximum displacement. The result was a V-8 that depending on compression ratio could rip off 415-425 horsepower during chassis dyno-testing. And it was fast, real fast. In ’63 a Max Wedge was piloted to a 12.22 second time at 116.73 mph at the U.S. Nationals. Because the engine could be fit into several different models most people went for the lightest option available, which was the Savoy (pictured above). Those looking for a smoother ride dropped the Max Wedge into Belvedere and Sport Fury models. The variety of body style options makes any Max Wedge 426 restoration an intriguing muscle car project. How would you clothe the beast?